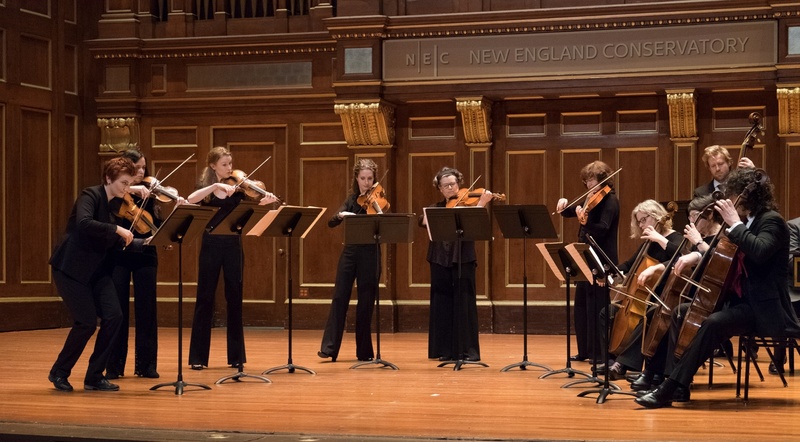 On Feb. 16, the Handel and Haydn Society performed all six of Johann Sebastian Bach's “Brandenburg Concertos” at Memorial Hall's Sanders Theater. Founded in Boston in 1815, the orchestra brought an incredibly charismatic and artistic performance to the stage, while maintaining respect for the source material. The small group was composed of string, wind, brass, and percussion instruments. They began with Bach’s “Brandenburg Concerto No. 1 in F Major,” projecting their warm and rich sound across the hall effortlessly and drawing the audience in with each sweep of the bow. The sound brought listeners to a different time. Recreating the intimacy of a Baroque era concert in a venue as large as Sanders Theater was a challenge that the group met with impressive ease. For their next number, “Brandenburg Concerto No. 5 in D Major,” the group rearranged to feature flutist. Christopher Krueger, violinist Aisslinn Nosky, and harpsichord player Ian Watson. The trio was also supported by a small string ensemble. Despite the eclectic mix of instruments, the trio performed smoothly as a single unit of sound. Each artistic intent was perfectly matched. The string ensemble that supported the trio also accompanied them energetically, buoying the soloists up with their own lines. 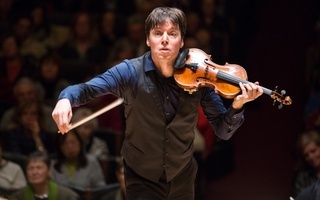 During many of the performances, the violinists stood on opposite sides of the stage while the rest of the orchestra remained in the center such that the violins resembled two arms of a single human body. This arrangement helped to distinguish the different parts and made their melodies and harmonies much clearer. 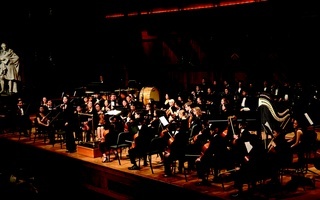 When they played in unison, the orchestra united even the most diverging parts. In the third concerto, Aisslinn Nosky’s performance shone with her vitality and musicianship. Leading the group, Nosky fiddled along with dance-like movements, all the while playing with incredible sophistication. She grinned at both the ensemble and the audience as she played. Her charisma was infectious, pulling the audience in further as her notes continued to bounce off every inch of the hall. As the melody passed to different instruments, Nosky danced out of the way, giving the spotlight to others. The members of the group listened to each other with sensitivity, discerning individual voices. They also manipulated their tones to give each line a purpose: Long held bass notes in the background were active and deliberate, drawn from the string to bolster the melodic line floating above. During “Brandenburg Concerto No. 2 in F Major,” trumpet player John Thiessen’s solo transcended the orchestra, sounding more like an oboe than a trumpet. An anguished cry left a haunting feeling pervading across the concert hall as an oboe-like piercing tone replaced the hearty, typical sound of a brass instrument. This voice was surprising but ultimately pleasing. Nosky’s virtuosic violin solo highlighted the first movement of “Brandenburg Concerto No. 6 in B-flat Major.” She brought robust and powerful emotion to the score. Again, the performance emulated the atmosphere of an intimate house concert rather than a massive hall. The transition from phrase to phrase invited the audience along in the story that the players wove. The group reserved Bach’s “Brandenburg Concerto No. 4 in G Major” for the final performance of the night. An ethereal recorder solo established a mournful atmosphere. When the orchestra whirled directly from the “Andante” to the “Presto” sections of the piece, the group provided yet another captivating performance. The duet between violin and recorder leaped in every direction possible, the duo performing with ease and excitement. Though the pair played together as a single entity, they stressed the differences in sound between their instruments, a decision that came as unusually delightful. More than 200 years after its creation, the Handel and Haydn Society continues to breathe life into its Baroque and classical repertoire. Their mesmerizing rendition of Bach's “Brandenburg Concertos” brought a depth and excitement to the stage that is not easily replicated. The concert, billed as “A special tribute to Steven Stucky,” indeed provided a fitting commemoration to the contemporary American giant while also doing justice to the works of the other composers featured on the program.